President Barack Obama has urged Turkey and Russia to end their dispute, a week after Turkish forces shot down a Russian warplane. After talks with President Recep Tayyip Erdogan in Paris, Barack Obama reaffirmed US support for “Turkey’s right to defend itself and its airspace”. However, the US president stressed that Russia and Turkey should “de-escalate” their dispute. “We all have a common enemy,” Barack Obama said, referring to ISIS. “I want to make sure that we focus on that threat,” he said. “Turkey is a NATO ally,” Barack Obama added. Recep Tayyip Erdogan also spoke to reporters after December 1 meeting. He said his government wanted to reduce tensions and was “determined to keep up the fight” against ISIS. Barack Obama and Recep Tayyip Erdogan are among 150 leaders attending climate change talks in Paris. Recep Tayyip Erdogan renewed his criticism of Russian air strikes against Turkmen rebels in north-western Syria, complaining that the area is being “continuously bombed”. 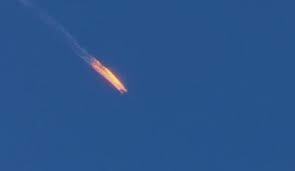 Moscow says Turkey shot down its SU-24 warplane inside Syria on November 24. Turkey says the fighter jet entered its airspace and was repeatedly warned to leave before it was downed. Russia has insisted its warplane did not cross the border and that it gave advance notice of the flight path to the US. One Russian pilot was killed and the other rescued. A Russian marine was killed during the rescue operation. Russia is a major ally of Syrian President Bashar al-Assad and its air strikes have targeted rebel groups, including ISIS. Turkey strongly opposes Bashar al-Assad and has been accused of turning a blind eye to jihadist fighters crossing from its territory into Syria.